This article is a stub and is missing information. You can help Stardew Valley Wiki by expanding it! This page covers how to do common tasks in SMAPI mods. Before reading this page, see the Modder Guide and Game Fundamentals. Items are objects which represent things which can be put in an inventory. Tools, Crops, etc. Where parentSheetIndex is the ID of the item (can be found in ObjectInformation.xnb). This is dependent on the inventory - rarely will you be calling this directly, as the game has functions for this for the Player, located in Farmer (in the main namespace). Note that farmhands in multiplayer can't see all locations; see GetActiveLocations instead. -XNB extractor, from this link: "www.mediafire.com/file/4c0g0fk3tza384o/XNBExtract.zip"
-Image editor. I strongly recommend PS or another program that lets you edit the spritesheets in 8-bit mode. -Multiplayer fix, so it doesn't make your friend's game crash. So, what you'll be doing is extract the XNB you want to modify (mostly the hairstyles and the clothes) with the XNB extractor. Once there, follow the readme in the extractor. As far as we know, you cannot "add" new hairstyles or clothes, but you can modify the ones there. So what you are going to do is select one line of three views of a hairstyle and one line of four views of clothing. There, you'll change them as you wish. A point here. If you want to make a character like, let's say, Master Chief, you'll get one line of clothing, and draw it as Master Chief's armor. Then get one line of a kind of hairstyle, and make the first one (the one that shows when the character is facing south) and cover it completely as the helmet would do, then finish the other two views of the helmet. We say this because it's infinitely easier than going into the farmer_base spritesheet and changing one by one the faces. For characters without helmet, you'll either have to change the faces manually in the spritesheet or try to go around with the in-game creator. You can change the skin color and the boots too, accessing them in-game with the mod that enables the multiplayer fix and let's you change your clothes anytime. A Character's position indicates the Character's coordinates in the current location. Each location has an ``xTile`` map where the top-left corner of the map is (0, 0) and the bottom-right corner of the map is (location.Map.DisplayWidth, location.Map.DisplayHeight) in pixels. There are two ways to get a Character's position in the current location: by absolute position and by tile position. Position.X and Position.Y will give the XY coordinates in pixels. getTileX() and getTileY() will give the XY coordinates in tiles. The viewport represents the visible area on the screen. Its dimensions are Game1.viewport.Width by Game1.viewport.Height in pixels; this is the same as the game's screen resolution. The viewport also has an absolute position relative to the map, where the top-left corner of the viewport is at (Game1.viewport.X, Game1.viewport.Y). The UI is a collection of separate elements which make up the HUD and occasional popups. 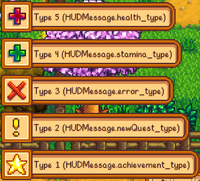 All of the types for HUDMessage as they appear in-game. Color: Fairly obvious. It should be noted that while the first two don't give an option (they default to Color:OrangeRed), the fourth with the param 'leaveMeNull' displays as the same color as the game text. public HUDMessage(string type, int number, bool add, Color color, Item messageSubject = null); - This allows for expanded customization of the message. More often used for money. public HUDMessage(string message, string leaveMeNull) - Also displays no icon. public HUDMessage(string message, Color color, float timeLeft, bool fadeIn) - Displays a message that fades in for a set amount of time. Note: For those of you who want a custom HUDMessage: - Almost all of these variables are public, excluding messageSubject, so feel free to customize! For example: add a new HUDMessage to show toaster popup. You can use Reflection to get the current active menu in GameMenu. The GameMenu contains the Inventory, Skills, Social, Map, Crafting, Collections, and Options pages in this respective order, accessed by the tab index with inventoryTab at 0. It's very easy to cause crashes, errors, or subtle bugs, including difficult-to-diagnose memory corruption errors. SMAPI can't detect incompatible Harmony code. Crossplatform compatibility is not guaranteed, and should be tested on all three platforms. May conflict with other Harmony mods (e.g. if two mods patch the same method, or two mods try to load different versions of Harmony). Harmony patches may have unpredictable effects on other mods that aren't using Harmony. Using Harmony should be a last resort, and is deliberately not documented. Use IAssetEditor to inject new mail into Data\Mail.xnb. Then use Game1.addMailForTomorrow to send it to the player. Where mailName is the letter key in Mail.xnb. If you use the string wizard anywhere in the letter key, the letter will have the Wizard's new background (since 1.3) automatically. When all else fails, when you've looked at the decompiled source too long and it makes no sense, take a look at some open-source mod code! See the 'source' column in the mod compatibility list for source code. This page was last modified on 31 October 2018, at 16:43.